Horns from a Mexico Ranch. 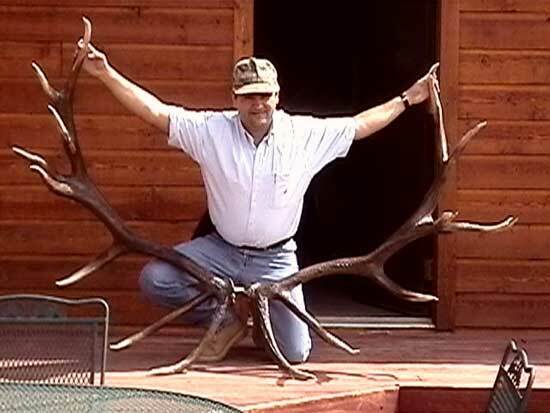 That is a awesome rack..did it score?? THIS RACK COMES FROM COLORADO, AT ROGER PROCK¥S RANCH. How Wide?? Surely 70" or close huh? That is a nice elk i could have had a 7×7 bull that was almost that wide in Gallatin Gateway Bozman but somebody trespassed on my uncles land and shot it. This is one very nice rack. However, because the antlers have been removed from the skull, the spread seen here is likely greater than it would have been otherwise. Zoom in and see if you agree. all i can say is darn!!!! thats bigger than the 8×8 me and my bro. saw scouting in a spike only area. I agree with disclaimer, that bull wouldn’t be that wide if the horns were still attached to the scull. It’s still a nice bull though. Im 45 years old and hunted deer and elk with my brother since 1976. We collect sheds and make things with them. Those sheds would make a nice floor lamp. Nice find!! !